THAI Offers More Royal Orchid Plus Mileage Accrual and Bonus Miles. Read MoreTHAI Offers More Royal Orchid Plus Mileage Accrual and Bonus Miles. Thai Airways International Public Company Limited (THAI) will serve special desserts for passengers traveling on THAI flights from 13 to 15 April 2019, celebrating this year’s Songkran Festival. Thai Airways International Public Company Limited (THAI) held the signing ceremony for a Memorandum of Understanding (MOU) on Personnel Development between THAI and Expressway Authority of Thailand (EXAT) at THAI Head Office. Thai Airways International Public Company Limited (THAI) celebrates its 59th Anniversary and launched the “RakKhun Tao Fah2019”event that is being held from 14 March to 17 March 2019 at Fashion Hall, 1st Floor, Siam Paragon. Thai Airways International Public Company Limited (THAI) collaborated with The Okura Prestige Bangkok to launch the “World Elegance the Washoku” project in order to serve authentic Japanese menu or “Washoku” on board THAI flights. Thai Airways International Public Company Limited (THAI) provides further assistance to stranded passengers as a result of sudden closure of Pakistani airspace due to rising tension between Pakistan and India situation. 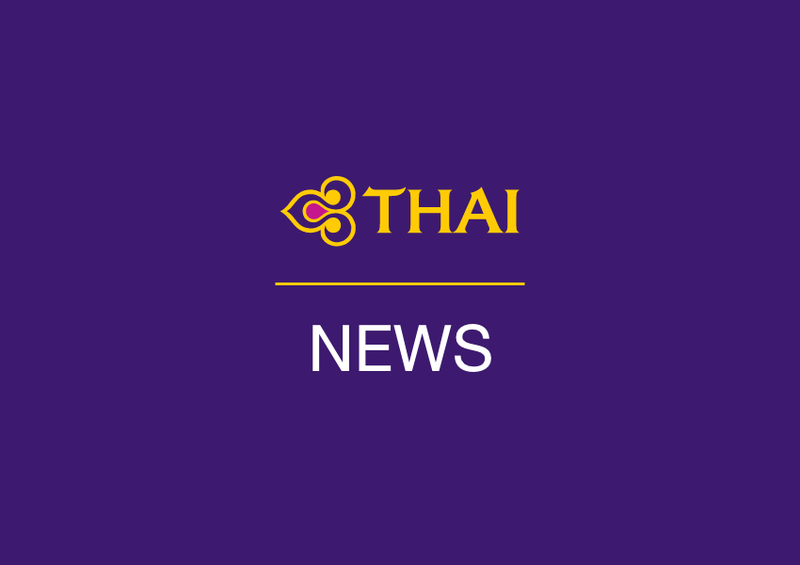 Thai Airways International Public Company Limited (THAI) and its subsidiaries announced their results for 2018 with total revenue of THB 199,500 million, a 3.9% increase from last year. Read More THAI Sponsors 7th Dubai Football Super League Competition. Mr. Korakot Chatasingha, THAI Director of Thailand Regional Sales, said economy class tickets are available at special price for adolescents from 12 to 25 years of age. Tickets can be purchased now until 31 March 2019 for flights that commence as of 3 March until 31 July 2019. Read More THAI Welcomes Representatives from Malaysia Tourism Promotion Board. Read MoreTHAI Offers Special Valentine Desserts. Mr. Wiwat Piyawiroj Executive Vice President, Commercial Thai Airways International Public Company Limited (THAI), recently presided over a lucky draw for passengers who traveled with THAI throughout 2018 and completed the THAI Customer Satisfaction Survey (e-TCSS). Mr. Sumeth Damrongchaitham, President of Thai Airways International Public Company Limited (THAI), welcomed Mr. Jeffrey Goh, Chief Executive Officer of Star Alliance GmbH, who made an annual visit to THAI headquarters. Mr. Nivat Chantarachoti, General Manager Singapore, Thai Airways International Public Company Limited (THAI) (fourth from left) and Mr. Satit Amphan, THAI Airport Services Manager (fifth from left), represented THAI at the ASEAN MaxiMICE Campaign Launch event in Singapore. Thai Airways International Public Company Limited (THAI) held a seminar in Tokyo on “TG Japan Explores Thailand Secondary Destinations,” in accordance to Thailand’s government policy to encourage travel to secondary cities in Thailand. Thai Airways International Public Company Limited (THAI) and Citibank are pleased to offer a special promotion, “HAPPY IN LOVE 2019 for 2,” for passengers traveling in a group of over two people during the month of February. THAI Celebrates Chinese New Year with Special Desserts. Read More THAI Celebrates Chinese New Year with Special Desserts.